The primary purpose of a dive float and dive flag is to alert boat traffic to the presence of divers below and warn them to keep clear. For safety, a dive flag must be flown when diving in most inland waterways and offshore sites. As one early diver suggested, "You don't want to have your hair parted by a propeller." 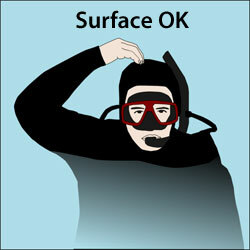 Diver Below Signals The rules governing the use of a dive float and dive flag vary by state and locality. Diver Below Flag: In Victoria, any vessel with divers operating from it must always display signals by day or night to inform other vessel users. The daytime diver below signal is the international Code Flag 'A', at least 750 mm long and 600 mm wide for vessels less than 10 metres in length. 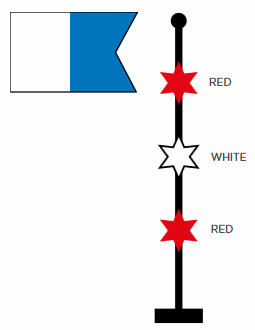 For vessels longer than 10 metres, the dive flag must be at least 1 metre long and wide. It should be placed to ensure all-round visibility. Diver Below Lights: During night diving, a vessel must show the international signal for a 'vessel restricted in its ability to manoeuvre'. These are three lights in a vertical line, top and bottom are red and the middle one is white. In Victoria, a five knot (9.3 kph) speed limit applies to vessel operators and water-skiers within a distance of 100 metres (328 feet) of a vessel or buoy on which a 'diver below' signal is displayed. Please note that the dive flag does not mean that other vessels can't come up to and right past the dive flag, or any vessel displaying a dive flag. There is no 'exclusion zone' — just a speed restriction zone. RRP: $30, Our Price: $25, You Save $5 (17%). This 750 mm by 600 mm size flag meets the minimum requirements in Victoria for a boat less than 10 metres long. We attach it to a long wooden broom handle and put it into a convenient rod holder. Most dive floats are a plain red buoy of suitable size. However, there are also dive floats capable of carrying a dive flag. Dive flag floats typically have a small, cylindrical Styrofoam collar that holds the flag upright. There are also dive flag floats resembling a tire inner tube covered with nylon mesh and cloth. Less common are rafts and small, towable boats. Many divers tow a dive float, or dive flag float, with non-floating line wrapped on a hand-held reel. At The Scuba Doctor for boat diving, we prefer to use a Buoy / Drift Line Setup (see below and Boat Diving Safety) with a red surface buoy at one end and a reef anchor/pick, or dive handle, attached at the other end. In addition, a small white float is placed approximately 12 metres (40 feet) from the reef anchor end. When diving from a boat, the regulation size dive flag flown from a high point on the dive boat with 360 degree view is sufficient. However, some divers still prefer to have a dive flag on the diver's surface float as well. When shore diving, each buddy team may be required to tow a dive float and flag. For shore diving, we recommend an inflatable dive float with small dive flag. RRP: $50, Our Price: $45, You Save $5 (10%). This is great for a scuba diving surface marker, or as a surface platform for spearfishing and free diving. It will glide effortlessly through the water and allow you to easily tow it behind you without feeling like you're pulling a truck. Handling a float and flag is not difficult, but knowing standard practices will help you avoid common mistakes. A dive float and flag is one more piece of gear that you must carry to the entry point for a shore dive. An inflatable dive float and flag is light and relatively easy for one diver to handle on shore dives. The other styles are more bulky, but may be easier to carry if the buddy pair carries it upright between them. When entering into calm water, hold the reel in one hand, let out about 1.5 metres (5 feet) of line and pull the float behind you. Entries through surf require additional finesse when towing a float and flag. Under no circumstances should you push the float in front of you through the surf. Breaking waves may push it back into you, causing injury or entanglement. Grip the reel in one hand and tow it at least 1.5 metres (5 feet) behind you. If you enter by ducking through the waves, be sure to release enough line so that the float can ride easily over the top without jerking your arm. To prevent injury, never fasten the towing line to your gear or wrap it tightly around your hand. Once you reach calmer water beyond the surf line, either prepare to descend, or continue surface swimming and towing the dive float until you reach your descent point. Exits with a float and flag are basically the opposite of entries. This time push the float in front of you so it never rides between you and the water movement. If a strong wave pulls the float toward shore and you struggle to maintain control, let go of it rather than try and hang on. It will wash ashore where you can pick it up after you are safely through the surf line. The towing, or tether, line can serve as a reference during descent. Gauge your release of the line so that the float remains more or less above you during descent, but pay out enough so that swells won't tug on your arm. Once at diving depth, the float may be secured in one spot or towed. If you plan to venture no more than 15 to 30 metres (50 to 100 feet) from the float, it may be acceptable to secure the tether line to a nonliving object or anchor it to the bottom with weights. If you move further away, or are drift diving, you should move the float accordingly, or begin towing it. If your planned exit is at a different location, such as when drift diving, you must tow the float and flag with you. Let out sufficient line so that the float rides easily over the surface swells without pulling uncomfortably on your arm. About a 45 degree angle between the tow line and the surface is usually sufficient. Letting out too much slack increases the risk of entanglement. Maintain awareness of the line position in relation to any potential obstructions such as an overhanging ledge, a protrusion on a man-made artefact, or other divers. Remember, never fasten the towline to your gear or wrap the line around your hand. If you don't have a reel, make a loose loop in the free end of the line. Slip this loop around your palm so you can quickly let go if necessary. To reduce the risk of entanglement, we recommend a 'diver freedom system' developed after diving for crayfish at Cape Jaffa some years ago. This system enables two divers to have some degree of diving freedom, at a safe distance from each other, yet still be in contact via the common shared line and small white float. As stated earlier, the common The Scuba Doctor practice is to use a 20 metre (65 feet) length of line with a red surface buoy at one end and a reef anchor/pick attached at the other end. In addition, a one metre line with small white float is attached. 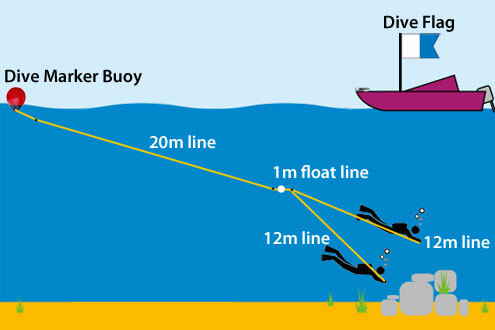 Then two 12 metre (39 feet) lines go to the reef anchors held by the divers. The small white float keeps the line almost vertical and therefore off the reefs, thus helping to avoid snagging. The small white buoy is also a big advantage for normal diving, as the small white buoy keeps the line almost (not always) vertical and therefore off the reefs. Thus using this 'diver freedom system', two divers are able to safely work rather independently of each other, yet still be in contact. For more details about the configuration of the 'Diver Freedom System', please see Boat Diving Safety. It's important to continuously reel in excess line as you ascend to prevent tangling on gear. The primary purpose of towing a float and flag is to warn boats that there is a diver below. Thus boats know that they should stay away, or reduce speed to below 5 knots. Unfortunately, the drivers of many boats and PWCs are not always familiar with the meaning of the flag or buoy. They may actually approach it to get a better look! 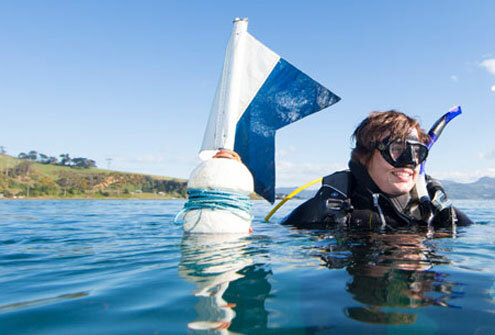 Divers should keep in mind that just because they stay within the legal 'safe' zone around their flag doesn't guarantee that boat traffic will keep its distance or reduce speed. Always look up as you ascend, revolving in a slow, full circle to check for boats and listen for the sound of a motor. If you detect the presence of a boat, remain at or below safety stop depth until it departs. Diver's Surface OK Signal When drift diving from a boat, the procedure is usually for one diver to tow a float (with or without a flag) and for the dive boat to follow. In this case divers are usually instructed to surface as a group. The pickup boat should not approach the float until all divers have surfaced. The 'OK' signal is given by the float handler and the boat approaches cautiously. Don't approach the boat until the engines have been shut down or put into neutral (i.e. no propeller is turning) and the boat captain captain signals that it is OK to board. A dive flag and float assembly can also be useful as a reference during the safety stop. Mark the towline at 5 metres (16.5 feet) below the main float and use the mark as a visual reference to maintain a constant depth. One buddy should tend the float line. At safety stop depth, with the dive float directly above, surface water motion is more noticeable than at depth. Hold the line loosely with elbow bent, to absorb the up-and-down motion of the float. Dive float and flag assemblies often double as surface support platforms. Instructors have students maintain contact with the float to keep them from drifting away while on the surface and as a reference point for ascents and descents. A few extra weights can be stored inside zippered compartments of some of the inner tube type of float. A float compartment could even hold a snorkel or extra mask. Don't fasten it to your person. Don't let it get between you and the wave action. Used properly, the dive float and dive flag will become another trusted diving accessory.